Villa Lam offers families of older children, or up to three couples who want to vacation together, a pleasant way to refresh and relax. This modern villa has wireless Internet service for those who choose to bring a laptop or iPod, or you may choose to use the computer provided on site. There is an iPod dock for your convenience. The media room offers several options for convenient inside entertainment when you want to take a break from the sun and fun. There is an outside BBQ and a pool to in which to cool down. For guests who want to take advantage of it, there is on- site fitness equipment. The living room and bedrooms are air-conditioned. This is a non-smoking facility. The Sunset! Views of Gustavia harbor! 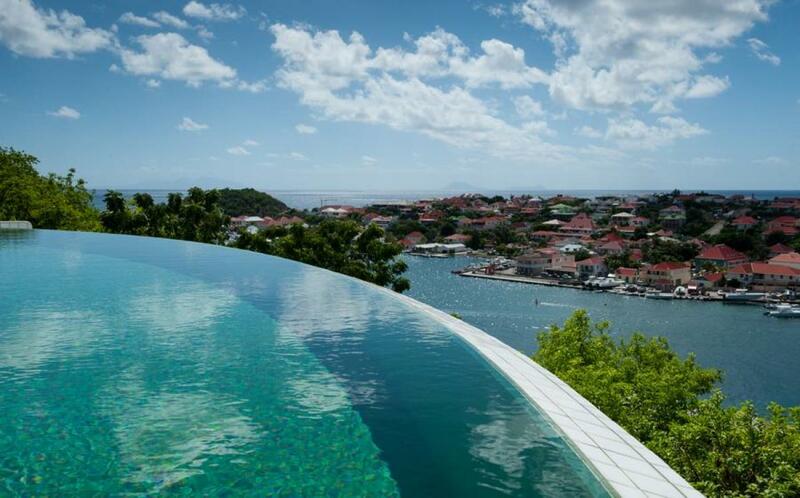 Villa Lam is located on the heights of Gustavia, close to the port, its shops, and restaurants. This contemporary villa with a view of the port of Gustavia is recommended for lovers of the yachts, traffic, and the city night lights. Three air-conditioned bedrooms with king-size beds offer views of the ocean and Gustavia harbor. Each bedroom has a TV with US satellite, DVD, mosquito net, safe; private terrace, and mini-bar. En-suite bathrooms with showers. Bedroom 3 has an outside shower. This villa is not offered in low season. Shell Beach is the nearest beach.